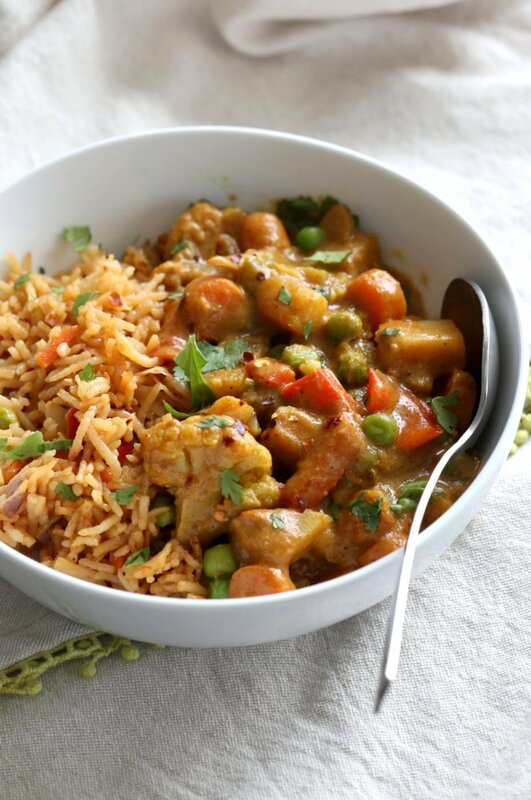 Vegetable Korma – Veggies in Spiced Ginger Chile Sauce. Creamy Indian Korma Recipe made without Onion and garlic. Vegan Indian Gluten-free Soy-free Can be made nut-free. No Onion No Garlic Recipe. Instant pot option. 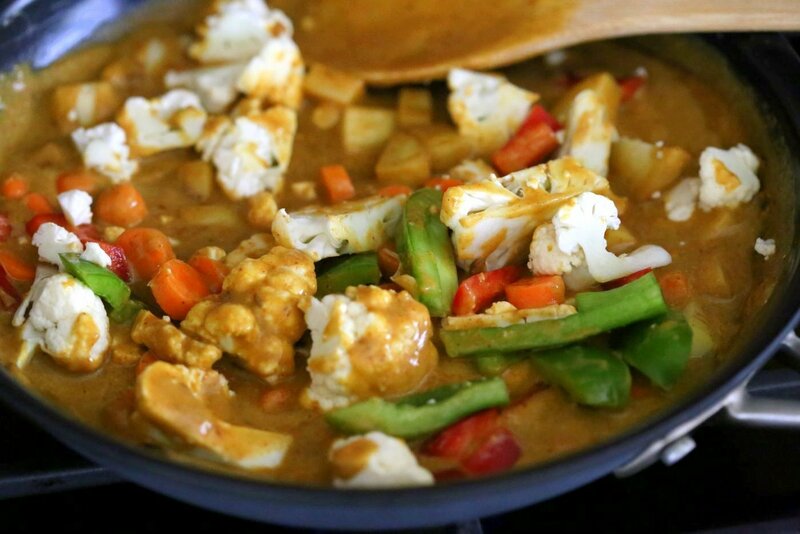 Weekends always have me craving Indian food, so here is this quick Korma Sauce with vegetables of choice. There are several different types of kormas. Some are decadent, some light. Some use lots of whole spices, some use just a few and some use coconut. This korma sauce is a simple sauce made with whole spices, ginger and chili and then thickened with cashews. The sauce does not use onion and garlic as is used is many korma sauces. Some regional cuisines in India do not include certain root veggies like onion and garlic, or allium. 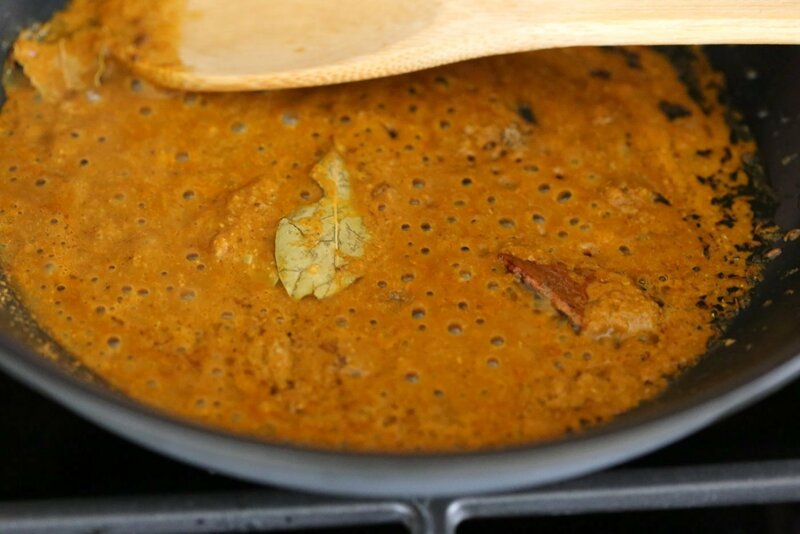 This delicious and easy sauce has a similar flavor punch of my restaurant style Navratan korma sauce (from my first book), but simpler and without any onion and garlic. Use whichever whole spices you have and Use other nuts or coconut as sub for cashews. Lets get to this delicious Clean up the fridge Veggie Korma. Also in other news, get both my books on Kindle Matchbook DEAL, ebook version 88% off for only 2.99 on amazon US, when you get the print copy. If you already bought the print copy at any time past or present (for yourself or for gifting), you get this deal too! Head to the book page and it will automatically show you the deal if you have a print copy order in your account. Take the ebook with you on kindle, computer or your phone! Pictured above with Spiced Fried Rice. I added 2 cloves and a cinnamon stick with the cumin seeds. 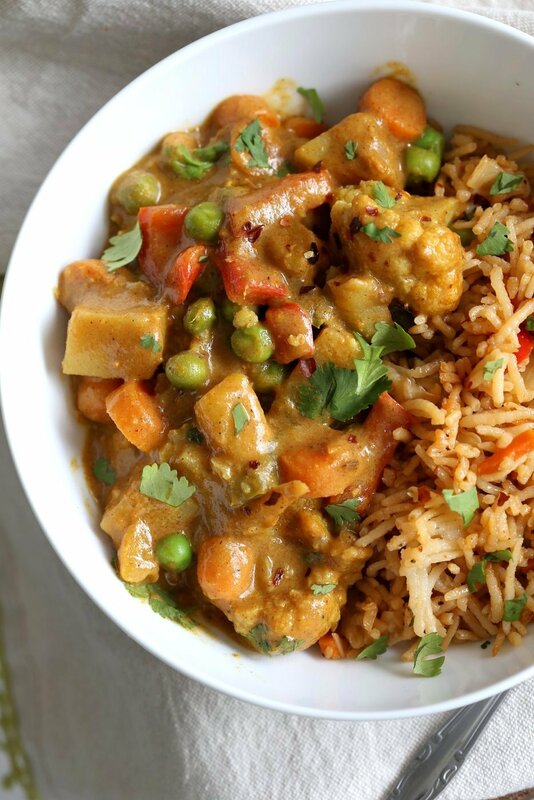 Vegetable Korma - Veggies in Spiced Ginger Chile Sauce. Creamy Indian Korma Recipe made without Onion and garlic. Vegan Indian Gluten-free Soy-free Can be made nut-free. No Onion No Garlic Recipe. Heat oil in a skillet over medium heat. When hot add cumin seeds and let them start to change color. Add cinnamon stick, cardamom and bay leaf and mix in. Toast for half a minute. Add the blended ginger chili spice mixture. Reduce heat to medium-low and cook for 3 to 5 minutes. stir frequently to avoid burning. Add blended cashew milk to the skillet and mix in well. Cook for 2 minutes. Increase heat to medium. Add the vegetables that take longer to cook and salt. Cover and cook for 12 minutes. Add in rest of the vegetables and mix in. Taste and adjust salt and heat. Cover and cook for another 5 to 10 minutes or until thickened to preference and all the vegetables are cooked. Adjust consistency if you wish with some coconut milk or cashew cream for creamier. Garnish liberally with cilantro and some pepper flakes and serve with lightly spiced rice or flatbread. To make this nut-free: Use 1 cup full fat coconut milk. To make this with onion and garlic: Add a 1/4 cup chopped onions and 4 cloves of garlic (chopped) after adding the whole spices. Cook until golden, then add the ginger chili blend. Nutrition is 1 of 4 serves. I just bought both Kindle books for $2.99 each. Thank you!! yay! I didnt even know that it was on for the first one 🙂 so glad you got both! Is there a recipe for the rice that you have alongside the korma? This looks AMAZING! As does ALL of your posts! I was FINALLY able to pick up your India Kitchen book the other day and I already made the Rajma Kidney Bean Curry! I blogged about it tonight actually! Swing by and let me know your thoughts. I’m also going to add your blog to my sidebar. Hope you don’t mind! CHEERS! Awesome! I am so happy you got the book. The first book is amazing. (as is the second), i will always love the first more 🙂 Thank you for adding the blog to your sidebar! Hey! thanks so much for all the amazing recipes. 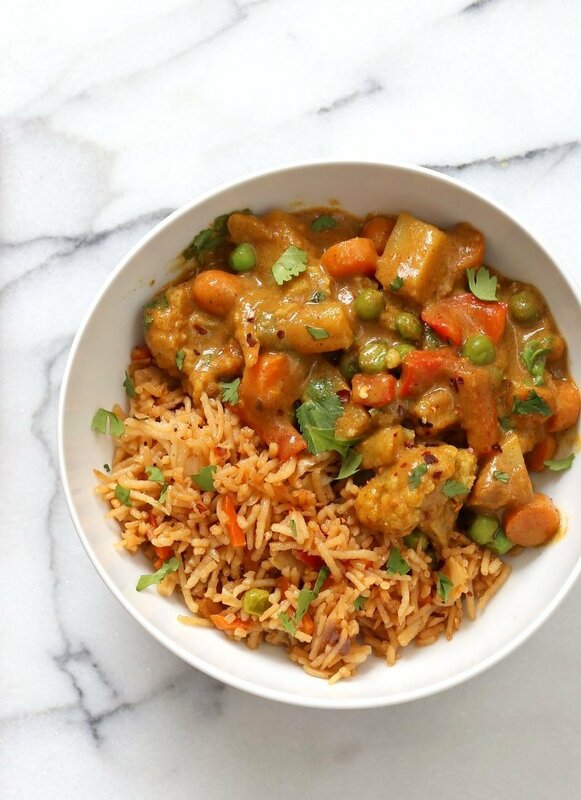 ..I am vegan and love Indian food so your recipes are incredibly helpful! I’m just wondering could you clarify..it says mix the spices with lemon and water but it doesn’t say anything about water in the ingredients? 3 tbsp water. i’ll add it to the ingredients. I am so glad I have your first cookbook – I absolutely love it. I have a blog where I write about feeding vegan kids and I’ve found ways to make your spicy meals (which I love) and feed the kids without making two dinners. So many of your recipes include making a tempering that is just added at the end so I can take out the kids’ portions before adding the kick to the rest. It works really well for us. Thats awesome! So glad that everyone loves the meals! Thats awesome! you should get my first book with 150 Indian recipes from various regions, restaurant style as well as everyday food and various levels (easy to moderate). Happy cooking! Such a great recipe, yummy! Thanks for sharing this here, I always wanted to make changes on how I prepared some veggies to my daughter since she hates vegetables that much. She will love this for sure! Hello from Vegan Vigilante. This looks so good. I’m always looking for tasty Indian recipes to cook for my boyfriend. Thanks so much for sharing! Can’t wait to make this. I meant boyfriend. LOL. Can you please delete the s on the end of boyfriend? Thank you, that sounds so funny like that. Richa can you make this in the instant pot? The ginger chile spice mix will most likely burn in the IP. Veggies will also tend to cook to mush as cauliflower generally hold up well under pressure. If you are using other hardy veggies (potatoes, sweet potatoes carrots etc), then 2 minute on manual and natural release should work. It should work fine. I dont use slow cooker, so i am not sure about the times. Was tomato left out of the ingredients list because when I tried making this it didn’t have the same rich orangey colour until I luckily had some canned puree tomatoes on the side and mixed it in. Before I poured it in the mixture was sand coloured. There isnt any tomato in it. The ginger spice mixtures gets roasted and adds color. The roasting time and the spices might determine the color. I also do add a bit more cayenne as everyone in the house prefers hotter indian food. You can add tomato puree. Its a flexible recipe. There are several types of traditional korma/kurma sauces and this one doesnt use onion, garlic or tomato, but the sauces can always be adjusted. I am looking for ways to get a picky eater to eat beans. 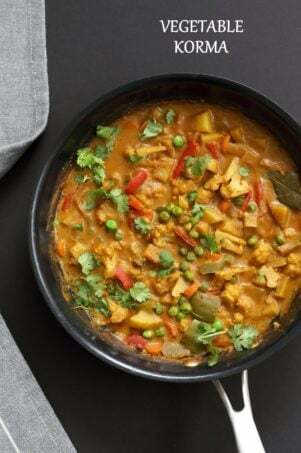 I want to make a very VERY mild, allium free curry/korma sauce that will utilize red lentils (boil&puree) as a main ingredient (they thicken the sauce when boiled). Then I could fill it up with veggies in a “what’s in the fridge” style. No nuts allowed (sorry). Is this at all doable? I tried adapting a recipe already – it was ok but it didn’t even smell like curry and I missed that sweet creamy curry taste element of my childhood. Can you help? The lentils will alter the flavor and need more spices as they are a prominent flavor profile. Can you do coconut? then use coconut cream insted of nuts. try this one with the coconut cream and just a bit of pureed lentils if you wish. Add more spices and more salt and sugar/sweetener to balance out the flavor.